Hormel Foods Corporation (NYSE: HRL) today announced it surpassed its goal to reduce solid waste 10 percent by 2020 six years early, with the release of its 2014 Hormel Foods Corporate Responsibility Report. • Surpassing the solid waste goal by 20 percent (originally set to reduce solid waste to landfills by 3,500 tons by 2020). In 2014 alone, the company’s operations implemented projects that reduced the amount of solid waste sent to landfills by 1,500 tons. The company plans to reevaluate and establish a new goal related to solid waste and will report the goal/progress in next year’s report. • Awarding the first international winner of the Hormel Foods 2014 Sustainability Best of the Best competition to the Beijing Project Blue Sky team at the Beijing HFC Plant (Beijing, China) for their achievements in reducing greenhouse gas emissions. o Reduced more than 2,500 metric tons of greenhouse gas (GHG) emissions from domestic manufacturing operations (32 percent of goal when combined with previous progress). o Reduced energy use by 17,400 MMBtu (45 percent of goal when combined with previous progress). o Reduced water use by 0.082 billion gallons (67 percent of goal when combined with previous progress). o Reduced product packaging by 8.27 million pounds (68 percent of goal when combined with previous progress). • Donating 2.5 million cans of SPAMMY® shelf-stable poultry product to help malnourished children in Guatemala, and $6.8 million in hunger donations, including products donated to food banks and disaster relief. In addition to this report, Hormel Foods will showcase the different focus areas of its corporate responsibility program through the “Our Way” video series, to be released periodically throughout the year. Additionally, Hormel Foods will be hosting a Twitter Chat with Triple Pundit following the launch of the report on Friday, June 5 at 1 p.m. CT (2 p.m. ET) at #Hormel3pChat. This Twitter Chat will focus on how Hormel Foods is meeting sustainability goals through employee engagement. This is the ninth corporate responsibility report for Hormel Foods, and the first report for the company that follows the new Global Reporting Initiative (GRI) G4 guidelines “in accordance” with the core option, with the Content Index verified as being accurate and aligned by GRI. 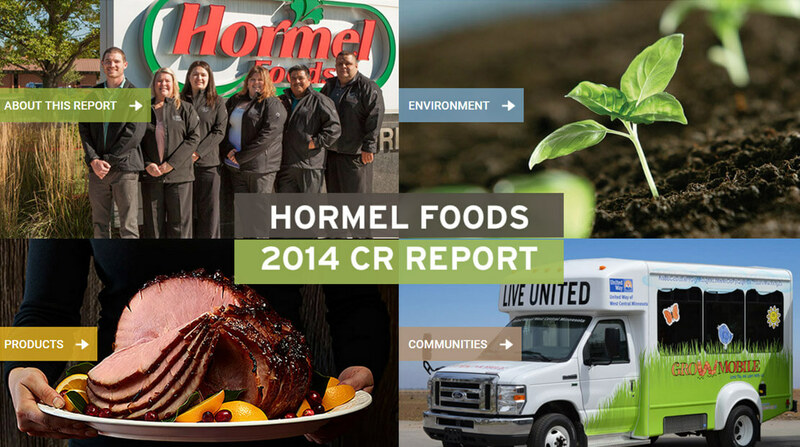 The Hormel Foods 2014 Corporate Responsibility Report is designed to allow stakeholders to easily view top-line highlights through the interactive online version and downloadable PDF. Readers are encouraged to provide any feedback about the report or corporate responsibility at Hormel Foods by emailing sustainability@hormel.com. Hormel Foods will continue to report on its environmental and social performance annually. The company’s next report will be released in June 2016 for data spanning from November 2014 to October 2015.